Happy Monday! It's another busy week around here with swimming lessons, a family trip to the dentist, my husband's birthday (today - Happy Birthday, JP! ), and probably some things I am forgetting! Today's project was super fun! 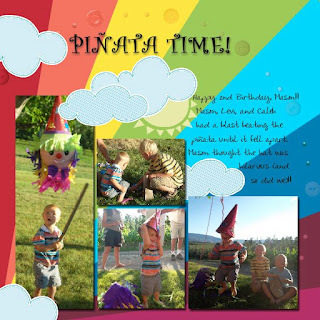 It's a rainbow layout and I used photos from Mason's 2nd birthday party last summer. I pulled the colours out of the pinata. Hope you've had a great start to your week! I have been collecting rainbow party ideas on Pinterest (probably for Rayna for next year! ), and I am going to add this to the file!! Love it! !